WE Knife Co. has created a modern adaptation of the Japanese Gyuto knife. 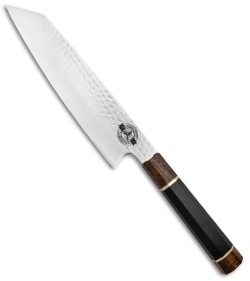 This Gyuto model is the first in WE's Kitchen Lifestyles Series and it features a black and bronze wood handle with a hammered 67 layer damascus blade. The Gyuto is traditionally one of the most versatile kitchen knives and you will find this WE fixed blade well suited for any kitchen task.